So anyway,: Arya gonna go my way? Arya gonna go my way? "The Girl Who Died" / "The Woman Who Lived" by Jamie Mathieson, Steven Moffat and Catherine Tregenna, directed by Ed Bazalgette. Spoilers after the cut. 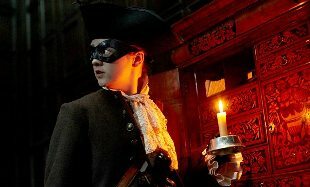 The show itself does seem to be pushing Ashildr as a possible companion, although I would have said more of a recurring guest star along the lines of River Song. In fact "The Woman Who Lived" particularly pushes Ashildr as a companion by having Clara stay out of the story completely, but it then puts the kibosh on the idea of her becoming a fixture in the TARDIS by giving her a different, specific role to play. Maisie Williams is good enough in the episodes (although in fairness the character's not a million miles from Arya Stark so it's hard to know how good an actress she'll turn out to be) that she'll be a welcome addition to the recurring cast. And this is a different take on the series' theme of two-parters, not so much a two-part story as a single story with its sequel presented straight afterwards. The individual stories themselves aren't classics (and the second one in particular not only features a fire-breathing Cowardly Lion but also Rufus Hound, so best not dwelt on too much to be honest,) but the overall theme of the Doctor being irresponsible with his god-like powers is an interesting one. A bit more Seventh Doctor, manipulative and dismissive of the consequences, rather than last year's outright nastiness - again, Capaldi's Doctor has a much more natural balance of fun and darkness this year. The Doctor's obviously never read a vampire novel though if he didn't think that an immortal human might come to resent him for his "gift." I liked the idea that Ashildr's forgotten most of her long life because the human brain's not designed to remember centuries' worth of lifetime, a nice new twist on a common story (like I say, usually found in vampire novels.) Not the best pairing of this series so far but still better than much of last year's output.